Now through October 29, Walmart and Sam’s Club are asking customers to support kids by making a donation of $1 or more at the retailers’ 130 locations to raise funds for Riley Hospital for Children at IU Health, Indiana’s only Children’s Miracle Network Hospital. Customers and members can add a “Miracle Balloon” donation during checkout, with 100 percent of funds going directly to Riley Hospital, helping kids in their own communities. Funds collected—most $1 at a time—are necessary for hospitals to provide the best care for kids. Last year, Walmart and Sam’s Club raised a record-breaking $1,422,399 for Riley Hospital. Every donation stays local to help Riley kids—like Ethan Tatlock of Lafayette, Ind. 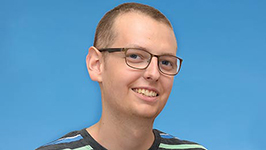 Ethan’s father Scott was diagnosed was diagnosed at 34 with osteogenesis imperfect by the Dysplasia Clinic at Riley Hospital, which treats both children and adults since it’s one of the few hospital clinics in the country with OI specialists. Riley doctors wanted to examine Ethan as well, and the family was weeks away from that appointment when Ethan, then nearly 2 years old, suffered a traumatic femur fracture and was transported to Riley Hospital from his home in Peoria, Ill. Over the next few years, Ethan suffered 13 more fractures and the family moved to Lafayette, Ind. to be closer to Riley and to family. Those important Indiana relatives include Ethan’s grandmother, Glena Engleking, who works for Walmart. With regular infusions of drugs aimed at increasing bone mass, Ethan has now been fracture free for nearly two years. Care for kids like Ethan are made possible in part due to corporate partners like Walmart and Sam’s Club. comprehensive children’s research hospital in the state of Indiana. 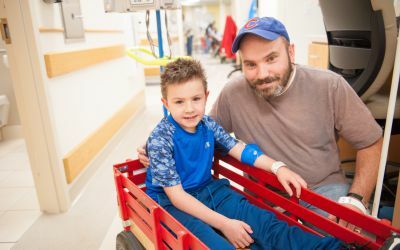 Our mission is to raise funds statewide to support Riley Hospital funding priorities: pediatric research and patient care, maternity and newborn health and family support programs. Riley Children’s Foundation also funds Camp Riley and the James Whitcomb Riley Museum Home and Billie Lou Wood Visitor Center. For more information, visit RileyKids.org.